One of the world’s eminent environmental scientists says modern agriculture has evolved over an 11,000 year period of “rather remarkable” climate stability. “Agriculture as we know it today is designed to maximize production with that climate system,” said Lester Brown, a former farmer and founder of the Earth Policy Institute in Washington, DC. 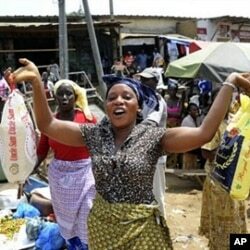 A woman holds bags of rice at a market in Abidjan. Some economists say food scarcity and rising prices could lead to social instability. The UN Food and Agriculture Organization (FAO) estimated that food production must be boosted by 70 percent by 2050 to meet growing demand. But across the globe, and especially in Africa, there are “serious drops” in food output because of increases in the volume and intensity of heat waves, droughts and floods, explained Tanzanian agricultural economist Ephraim Nkonya. Sir Gordon Conway, professor of international development at Imperial College in London, said more extreme weather events will happen in Africa because of climate change. “You’ll get big droughts and big floods in many countries. Often a country will have both more droughts and more floods at the same time,” predicted the former chief scientist at Britain’s Department for International Development. Environmental experts say the extreme weather events are exacerbated by global warming, principally caused by harmful gas emissions, such as carbon dioxide, from the burning of coal for energy. Brown has estimated that for every one degree C increase in temperature, yields of staple grains will drop by 10 percent. 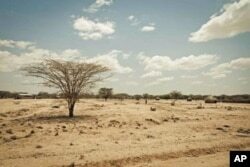 Large parts of Africa could warm by four degrees C by 2100, according to the Intergovernmental Panel on Climate Change. Conway warned that famine in Africa could spike dramatically in the near future as a result of more droughts, desertification and dwindling water supplies. Resulting reductions in crop yields, he said, could be as much as 50 percent by 2020 and 90 percent by 2100. Nkonya said, “Less food on world markets will mean that food will be more expensive and this scenario is already unfolding.” The economist analyzes the effects of climate change on agriculture and food production in Africa for the International Food Policy Research Institute (IFPRI). Nkonya said climate change would be particularly bad for African agriculture because the continent is almost completely reliant on rain, not controlled irrigation, to grow food. He pointed out that Africa is also especially vulnerable to more intense droughts and floods as about 70 percent of its population “survives by farming” and a third of the region’s income is generated by agriculture. “If agriculture collapses, Africa collapses,” said Nkonya. He said future dry conditions could lead to “considerable” decreases in outputs of two of Africa’s staple foods, maize and rice, as these crops need a lot of water to grow. Spreading dryness would increase hunger in parts of Africa that depend on maize and rice, two crops that depend on plentiful rainfall. 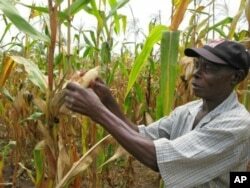 In some areas where maize now thrives, Nkonya predicted, its cultivation will be “impossible” because of sustained dry conditions. He suggested that higher temperatures could soon change the face of African food production, with a corresponding transformation of continental diets. Farmers, he said, will be forced to switch to crops that can grow in dry areas, such as cassava and millet. According to the FAO, just three crops – rice, maize and wheat – provide 60 percent of the world’s food. But Brown expects potentially disastrous decreases in their production because of climate change. “It’s already happening,” he said, citing recent examples from around the world. Scientists say a one meter rise in sea level would cover a large part of the Mekong Delta, the heart of Vietnam's rice industry. Then, earlier this year, the world food supply suffered a further blow when severe heat and drought struck in the U.S., the world’s leading grain producer. If this is so, the scientist said, it is “very bad news” for the world. “It’s going to create more and more political instability in the world and there’ll be more and more failing states,” he maintained. Brown said it is “scary” but feasible to imagine a heat wave on the same scale as the Russian event striking the U.S., which grows more than 40 percent of the world’s grain, in the near future. If this happened, he said, the implications would be dire. “That would have been an extraordinary shock to the world grain market. We would have seen grain prices climbing to levels we’ve never imagined before. In many of the lower income grain importing countries, they simply would not have been able to import enough grain for their people,” Brown explained. Brown also warned that the world “could pay the price” for not giving enough attention to the “very real” potential of a catastrophic food crisis in Asia as a direct result of climate change. He said warmer temperatures in the region mean that glaciers, especially in the Himalayas and on the Tibetan Plateau, are melting and “shrinking significantly” and that some smaller glaciers have already disappeared. China and India are the world’s top producers of wheat and rice. “Therefore, the melting of these glaciers (in Asia) coupled with the depletion of aquifers present the most massive threat to food security the world has ever faced,” said Brown. As a result, he suggested, people especially in developing countries would suffer, starve and die. Brown said the possibility of a significant rise in sea level because of warmer temperatures melting ice in polar regions represented another challenge to world food security, especially in Africa. According to a World Bank study, a one meter increase would cover a large part of the Mekong Delta, the heart of the rice industry in Vietnam, which is the second largest rice exporter worldwide. While China and India produce the most rice, they use it to feed their domestic populations and export comparatively little. Thailand has long been the largest rice exporter. But recent floods, worsened by the effects of climate change, say environmentalists, have destroyed its rice crops. This has sparked price increases all over the world, and has ensured that many poorer people can’t afford the more expensive rice. For millions of Africans, rice is a staple food. Africa is the second largest regional importer of rice in the world. South Africa, Nigeria, Senegal and Ivory Coast are all among the world’s leading importers of rice. Top scientist Gordon Conway is convinced that new technologies, such as genetic modification of seeds to make them drought tolerant, must be the most important part of Africa’s strategy to combat climate change and its threat to the continent’s ability to grow food. However, IFPRI’s Ephraim Nkonya said there’s little indication that the necessary investments are being made in new advances in agricultural research in Africa at the moment. “Adaptation to climate change, for example using crop varieties that are adapted to drought – the adoption rate (in Africa) is very low,” the agricultural economist pointed out. Nkonya said the new technologies are currently too expensive for Africa. Peter Holmgren, an agricultural scientist and director of a division of the FAO concerned with climate change, is more optimistic. He said the phenomenon is an opportunity for the world to improve its methods of producing food.